Savage Real Estate has been serving the North Georgia area since 1991. During these years, Savage Real Estate has seen lots of changes in the real estate market and has successfully met and capitalized on these changes. 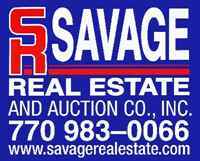 If you are looking for a home or land in the North Georgia area...Savage Real Estate has the expertise you need! Residential or commercial, Savage Real Estate can assist you with your transactions. If you want information on selling your property, trust the local real estate company with local people...Savage Real Estate & Auction Co., Inc.